School Districts and Charter Schools across the state of Arizona are required to administer the AzMERIT assessment each spring. Students in grades 3-8 are assessed in both Mathematics and English Language Arts (ELA). This assessment measures students’ understanding of the Arizona College and Career Ready Standards. Students in Grades 4 and 8 are also tested in Science using the Arizona Instrument for Measuring Standards (AIMS) assessment. 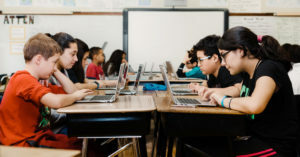 Both the AzMERIT and AIMS-Science assessments are delivered via online technology and scores are reported and made public on an annual basis. This is a three-year trend analysis highlighting the percentage of students at each grade level who scored in the proficient and highly proficient categories in ELA, Mathematics and Science. You'll find how our students' scores compare to all students across the state of Arizona. You can also see how Clarkdale-Jerome School compares to other schools in the Verde Valley.